Maria Judd, MSE, is responsible for developing and implementing strategies, programs and activities in support of the Canadian Foundation for Healthcare Improvement’s (CFHI) mission, and leading business development initiatives. Ms. Judd’s passion for healthcare improvement has evolved from her diverse roles within the health system, such as a community health centre board member, clinician, program manager and researcher. She has extensive experience in knowledge transfer and exchange, establishing and promoting new ventures, creating education programs, developing clinical practice guidelines and convening expert groups. 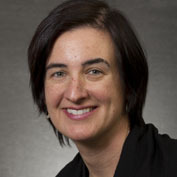 Prior to joining CFHI in 2005, Ms. Judd worked in a variety of health-related organizations. As the best practices program manager for the Canadian Physiotherapy Association, she designed a program of activities to support evidence-informed practices among members and their colleagues. She also coordinated the Cochrane Collaboration’s Musculoskeletal Group at the University of Ottawa. Ms. Judd holds a Master of Science in Epidemiology and Community Medicine from the University of Ottawa and a Bachelor of Science in Physical Therapy from the University of Toronto.